Nearly every state has done a quilt search. A few are still in progress, among them Delaware's. It's a small state (they have 3 counties; Kansas has 100), but important to quilt history because it was once a colony with a long quiltmaking tradition. It's great that they are posting pictures of what they've discovered in recording quilts. Check out their web page by clicking here. On the left click on Quilt Images, then pick one of the documentation days, for example, DV-3 to see a slide show. 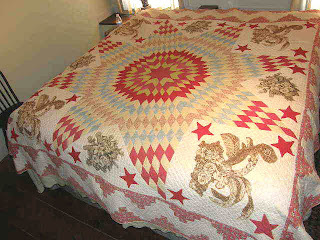 Click on the folder showing the state collection then the image of the quilt. You'll see it's signed on the reverse: "Catharine Collins Hur Work August the 7 1806". It was made in Smyrna, Delaware. The best thing is: It's a diamond star, what we might call a Star of Bethlehem and they might have called a Rising Sun. 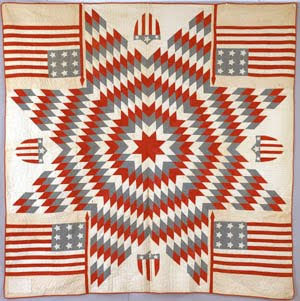 There isn't another dated example of this design until the 1830s, so this quilt is an important piece of pattern history. These pictures I have pirated from the Delaware sites are fairly minimal so here are some more pictures of the Rising Sun, new and old, that I've found on the web or in my email. 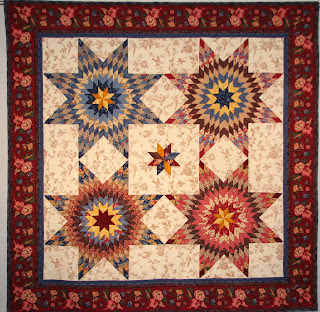 Unfortunately, there were quilt search projects and ones which were done better than others. Obviously there are a lot out there which didn't make it in the first time. 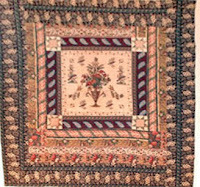 For instance, when I was in Connecticut, they did the quilt search project. I was going to be involved initially, but I got pregnant and decided that having a baby and working to the degree I wanted to on this wasn't in the cards. When they put out the call they said that you could take no more than some low number...3 or 5? quilts to the ID day. I had more antique quilts than that so none of mine made it in. I know that other states did a wonderful job, but I am also sure that there were many that missed the go through, which is to be expected. What is going to be done or what should one do to pick up the quilts which were not included in any initial survey? Wonderful quilts and I like the new version. I realized it must have been fussy cut for the flowers? Hello Michigoose! I too have some antique quilts that missed seeing the Indiana or New York surveys. I am not the best record-keeper either. 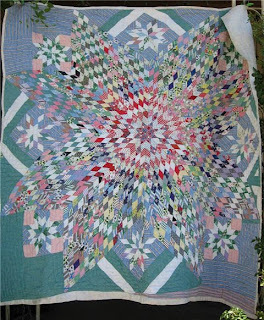 I think there are many many antique quilts out there and some are either a. really georgous and/or b. have family and local history associated with them. PS. to Barbara: I have really learned so much from your books and this blog. I have been a follower for awhile. Some quilts are in such bad shape, they would never make it to a book. 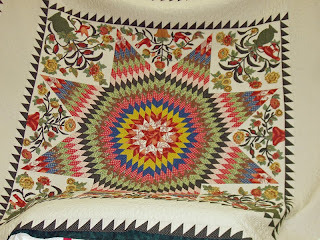 I hope you will take a moment and look at one I found in a thrift store and featured in my blog.